Time flies insensibly and today we are here again to present the report on the first quarter of 2016th software stacks market share. For the case you’ve missed it, check our previous statistics article with the passed year summary, to get a better view on the current software distribution trends around the world. This time, we’ve also added some new statistics for the current situation at a market to be represented more precise. Within these confines, the data on the Tomcat 8 application server usage (as one of the most popular cartridges among our users), the newest PHP 7 engine and distribution of the provided Node.js versions was included. We hope, that all of this information will come in handy for you, so let’s go on! As usual, we’ll start with the most important and intriguing data gathered – the general programming languages’ distribution ratio. The first quarter of 2016 brought some noticeable deviations in users’ preferences. After the conspicuous spike at the middle of 2015, PHP was pushed back to 41%. Herewith, Java continues to hold the leading position and even managed to conquer another 5%, holding more than a half of the general share (53%). 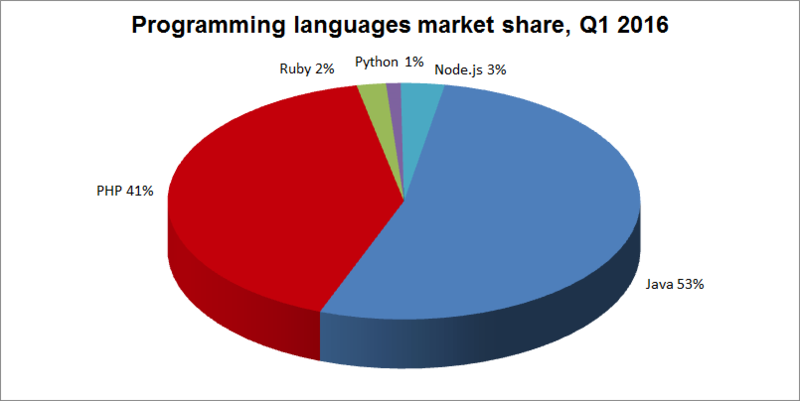 As for the less popular language choices, Ruby, Python and Node.js got 2%, 1% and 3% correspondingly. The more detailed data can be revealed through monitoring of distribution by regions. According to it, the highest usage of Java is still observed in India – 82%, while developers in Luxemburg prefer PHP – 78% of choices. At the same time, much changes in Ruby and Node.js regional preferences have occurred – both of them were mostly used at Switzerland (with 13% and 10% shares respectively). As for the Python leadership cup, it was moved from Belarus to Japan (7%). Databases market stays stable – MySQL leads with 65% part, overtaking its competitors a lot. However, the second by popularity MariaDB managed to grow its share by 6% (to 16% in total). The rest of databases’ rates remained almost unchanged: PostgreSQL got 13%, MongoDB – 7% and CouchDB failed to get even 1% of choices. Regionally, the new leader in MySQL usage became Moldova, with as much as 90% of choices. Similarly to the previous quarter, MariaDB is majorly preferred in Finland (41%), whilst the biggest amount of PostgreSQL and MongoDB developers live in the South Africa (33%) and Switzerland (20%). And the only countries, where CouchDB is still used, are the USA and Russia. Check the details in the following spreadsheet. Analyzing the previous year stacks’ usage statistics, we’ve noticed another major player in Java application servers market – Tomcat 8. Despite the fact this node is optional (since it’s implemented as a cartridge at Jelastic), it’s commonly available at the majority of our partners’ platforms and is widely used by developers. As for the distribution by countries, Tomcat 7 dominates in almost all regions (with the most choices in South Africa – 96%) except Australia, where it gave a way for Tomcat 8 (used in 60% of cases). 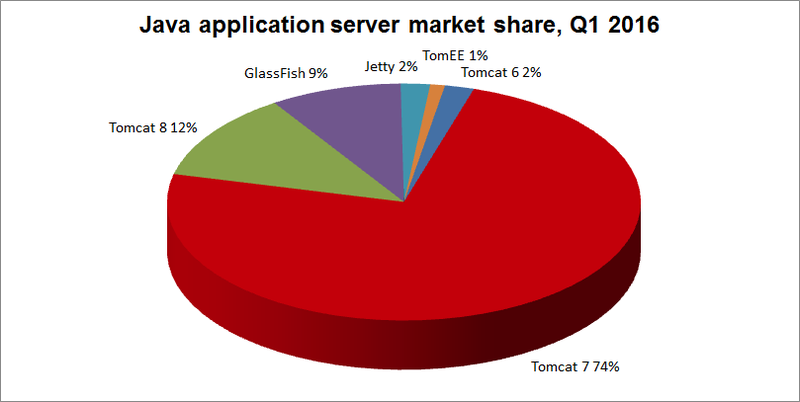 The highest rate of GlassFish usage was detected in Colombia – 19%, while for Tomcat 6 it is only 11% (Japan). Jetty got the maximum results in Italy and the Netherlands (8% in both), and TomEE didn’t manage to reach at least 5% point at any country. The general distribution of PHP app servers popularity hasn’t experienced essential changes. As usual, the preference was given to Apache – 77%, which means that NGINX got the remained 23%. Regionally, PHP application servers’ distribution differs a bit from the overall results in some of the countries – Mexico got the largest share of Apache users (97%), and Luxembourg became the country with the highest NGINX usage rate again – 41%. The Ruby application server market is stable as ever and hasn’t changed even in a single percent since the last time: Apache – 12% and NGINX – 88%. Such countries as Australia, India, South Africa, Italy and Spain haven’t used Ruby even once since the beginning of 2016 and thus aren’t represented within the graph below. Among others, 11 countries gave their preferences to NGINX with the 100% ratio, while for Apache the highest reached point is 50% in Luxembourg. Nothing too special has happened in Java engines preferences – traditionally, Java 7 was chosen more often than other versions (62%). Java 6 rose its share with 2%, making it equal to 21%, and Java 8 got the same 17% as the last time. The local distribution for today is the following: Java 7 dominates in almost each region, with the largest share in South Africa – 80%. The biggest Java 6 popularity (48%) was noticed in Finland, whilst in Australia developers prefer Java 8 (37%). As it was promised last time, today we include the latest PHP 7 engine statistics to our overview, aimed to help you to track the current trends and predict the future versions’ popularity. Beside that, the noticeable changes have affected the PHP engines market: though still remaining the most popular option, PHP 5.4 has lost 15% of the share, holding only 54% part for now. This opened the possibility for other versions to catch up: PHP 5.6 got 18%, PHP 5.3 – 15% and PHP 5.5 gained 10%. As for the PHP 7, this quarter it was used by only 3% of users, which, however, is still a good result considering that it was just added. Changes in the Ruby versions’ sharing are also significant. The pretty big percentage of Ruby 1.9.3 share has dropped, so it decreased in more than three times and constitutes only 6% for now. 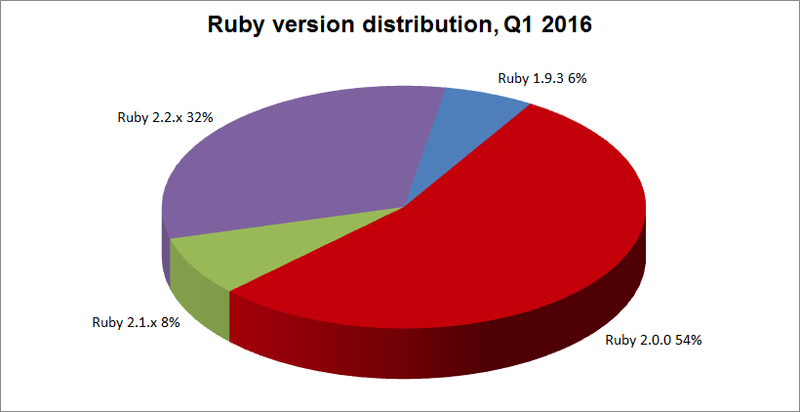 Herewith, Ruby 2.0.0 has conquered another 14% of the market, thus currently it controls more than a half of it – 54%. It’s closest concurrent is Ruby 2.2.x with 32%. And the remained 8% belongs to Ruby 2.1.x version. As it was mentioned above, five countries were excluded from the statistics, so it is presented only for those ones, who have used Ruby in the first quarter of 2016. Ruby 2.0.0 was the only choice in four different regions, and Ruby 2.2.x – in three of them (you can find these countries on the graph below). For Ruby 2.1.x, the highest rate of 50% was noticed in Kazakhstan, and the same ratio got Ruby 1.9.3 in Poland. Python market wasn’t changed much: the only difference is 1%, that Python 3.5 has managed to fought from the undoubted leader – Python 2.7, so they got 6% and 87% respectively. 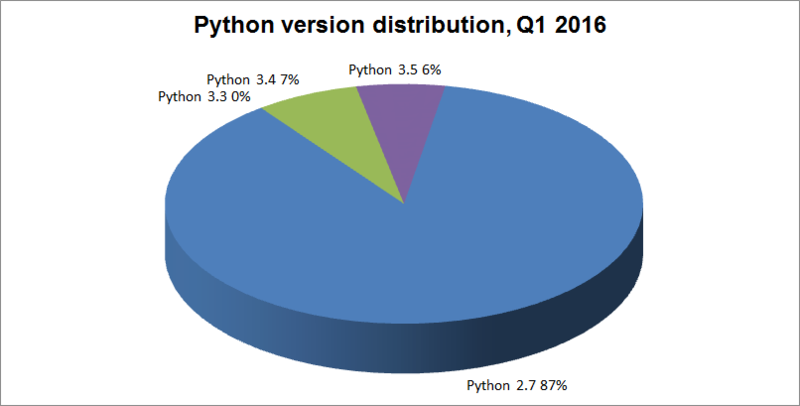 Python 3.4 share remained unchanged – 7%, whilst Python 3.3 unfortunately didn’t get a single percent of user’s choices. Another new member of our statistic is the Node.js engines’ distribution, that, we assume, you are interesting in. So, let’s dive right into the numbers: currently, the most popular choice is Node.js 0.10 with 53% of choices; the next is Node.js 4.x, which is not far behind with its 42%. 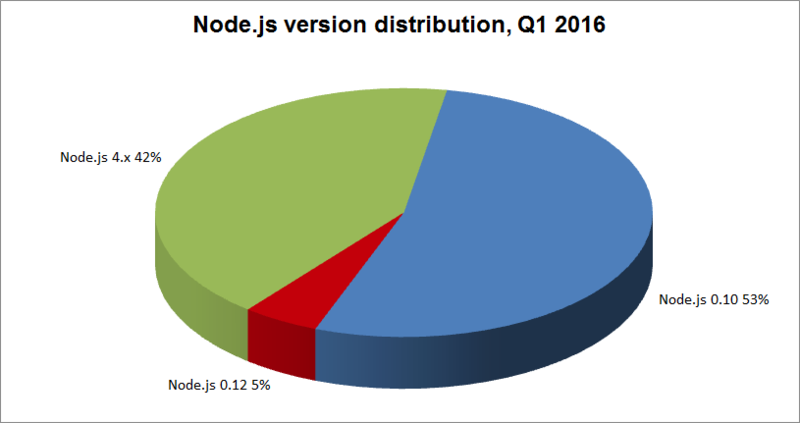 The last place goes for Node.js 0.12 – only 5% of users have selected it. The next time, we are also going to include the data on the most recent Node.js 5.x version usage as well. Regionally, we’ve excluded Japan, Australia, Luxembourg and Spain, as at these countries Node.js wasn’t used at all. Among the other ones, the highest rate was gained by Node.js 0.10 in Kazakhstan and Malaysia (both gave 100% of choices to it). As for the Node.js 4.x, its top plank was 69% in Russia, whilst Node.js 0.12 has scored 33% in Finland. To finish our statistics’ overview, let’s reveal the list of Docker images, that have been demanded the most during the analyzed period. 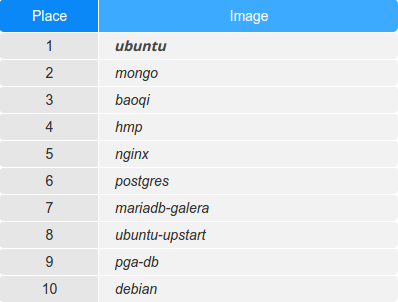 Comparing the obtained results with the preceding ones, the ubuntu image steadily holds the top line in our top-list. Herewith, the images down the rating were pushed back by the new racing participants, which have occupied the rest of leading positions: mongo, baoqi and hmp. In the end of the list, we can find the already familiar ubuntu-upstart (8th), debian (10th) and the newly added pga-db image at the 9th place. The 2016 has started pretty intensively – we can notice rather big changes in PHP and Java distribution ratio (in particular, Java popularity restoration after the drop down in 2015), PHP and Ruby engines preferences’ changes and, of course, influence of the new stacks inclusion. Will this become the normal states of affair or will everything just return to the last year confines? Subscribe to our blog and you’ll get to know this among the first ones with our next articles on the software stacks market sharing. Good luck and hope to see you the next time!